Toronto is the city with which I have the most complicated relationship. I don’t really like the place but it has become my home. I know this, in part, because twenty-eight years after moving from Ottawa, I’m finally able to write about Toronto in my fiction. A little background: I was born, in 1957, in Port of Spain, Trinidad. I emigrated with my parents to Ottawa, Canada three years later. For a while, Ottawa was not “normal”. Trinidad was normal until, after a few years, I stopped dreaming about Port of Spain and I began to dream about Ottawa: snow, cold, big streets, the parliament buildings, the National Arts Centre, the Rideau canal, etc. Ottawa became the place from which my imagination springs. I was thirty when I moved to Toronto. I moved for a number of reasons. For one thing, I wanted to be a writer and Toronto, being the centre of the publishing industry in Canada, was the most obvious place to go. Then, too, I’d always loved visiting T.O. – as it’s called when it’s not called “Trawna” or To-RON-to. But, of course, living in a place is different from visiting it. For twenty-five years, I was like a person in exile. For the life of me, I couldn’t write about Toronto. I wrote exclusively about Ottawa. That’s not unusual. Not knowing a city means, for me at least, not knowing where to set fictional scenes. Places have emotional reality for the writer. Setting my work in Ottawa, I knew at once where to place a break-up, say, or a conspiracy or moments in which characters contemplate life. This knowing isn’t so much for the reader as it is for the writer. The emotions one feels for places create a kind of atlas which one uses while writing. A concrete example: if I were to set scenes from a love story at the National Arts Centre, in Ottawa, there would be a kind of irony in it because the NAC means anything but love for me, whatever it might mean to others. In Toronto, for years, no place was, emotionally speaking, more significant than another. Toronto was a blank canvas that frustrated me. So, naturally, I chose to write about Ottawa, despite the fact that Ottawa receded in my memory and imagination until, in the end, my version of the city was almost as fantastic as Narnia or Flatland. I became more and more aware that my Ottawa had grown strange and unreal. But although, over time, I came to feel an intimacy with Toronto, I couldn’t write about it until, while writing a novella called A, I finally accepted that Toronto would never wholly belong to me, that it would never be “home” in the way Ottawa had been. Paradoxically, accepting my alienation from Toronto meant that I could write about it from an outsider’s perspective. I mean, by abandoning the hope that Toronto would ever be “home” in a literary sense, I was able to find a vantage from which I could write about it, a vantage from which Toronto was both meaningful and wholly unlike Ottawa. My two cities were no longer in competition within me. Curiously, when writing about Toronto, now, it feels as if the city were more actually present than Ottawa had been in my previous work. I’m at ease describing Toronto more minutely, depicting the city as concretely as I like. I never felt the need to do this when writing about Ottawa because, in the end, I was more interested in Ottawa’s emotional reality than it’s physical one. Toronto has entered my work almost bereft of emotional heft but with a weight no other city has had in my writing. I’m more aware of what Toronto looks like, what it is to the senses. And this more sensually present city is the one depicted in my most recent novel, Fifteen Dogs. All of which is to say that I’m now more aware of Toronto and of myself in it. It’s in this sense that Toronto has become “home”, but home as a place to explore, a home not taken for granted. Soon, though not yet, I may even accept the designation “Toronto writer”. To put it in nautical terms: the anchor that was Ottawa has been drawn up and I feel myself drifting to a port called Toronto. Many congratulations to André on winning the Giller Prize and thanks for a piece which conveys so perfectly the ambivalence many of us feel about calling a place ‘home’. Author photo © Hannah Zoe Davison. Location photos © Catherine Bush. I did briefly wonder if not being a big animal lover (although I do like dogs!) would be a barrier to enjoying this book; it wasn’t in the slightest and Fifteen Dogs is the best example of anthropomorphisation I’ve come across. In fact, it’s a triumph of characterization by any standards, in which canine and human attributes combine in a fascinating and unique perspective on life. 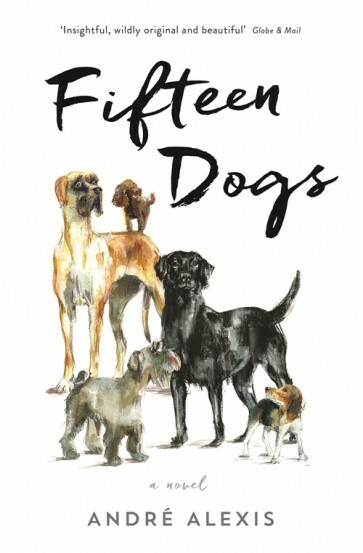 Whilst entertaining and often very funny, this novel has a particular depth and poignancy, deploying the dogs’ new consciousness to examine philosophical questions: what it means to be free/caged, to belong/be rejected, to be loved, to be heard – resulting in a new take on human behaviour in all its complex glory and vulnerability. It’s also a multisensory experience, with the dogs’ relationship to territory bringing the streets, parks and lakes of Toronto alive in a fresh and unusual way. If you need a book gift for someone thoughtful and curious, this is my top tip – if they happen to love dogs, even better! And since everyone’s started asking for Christmas present suggestions, next week I’ll be posting My Year in Books 2015, in which I look back on a very varied year of reading and name my personal favourites, most of which have appeared on the Literary Sofa. Sounds interesting and reminded me of reading Fluke years ago.